There are 3,476 Pakistani beneficiaries of DACA, former President Barack Obama's initiative providing relief from deportation to over a million young people brought illegally in to the United States as children. President Trump's decision announced by Attorney General Jeff Sessions today to end DACA in 6 months' time has put the future of these young men and women in doubt. 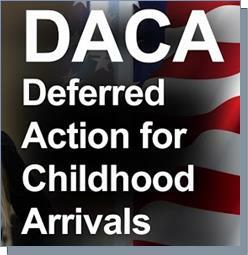 DACA is the acronym for President Barack Obama's executive order titled "Deferred Action on Childhood Arrivals". It was issued to stop possible deportations of over a million young men and women after the US Congress failed to pass the "Dreamers Act" that would have given them legal status in the United States. About 1.3 million DACA applications have been approved as of the second quarter of year 2017, according to the U.S. Citizenship and Immigration Service (USCIS). While the overwhelming majority of DACA recipients are from Mexico, the beneficiaries include 7,028 Indians (ranked 12) and 3,476 Pakistanis (ranked 23). There are two other Asian countries of origin among DACA beneficiaries: South Korea ranked 6th with 17,625 and Philippines ranked 10th with 10,099 who arrived in the United States illegally as children. Mexico tops the countries of origin with 1.2 million DACA recipients, followed by 56,633 from El Salvador at number 2 and 39,258 from Guatemala at number 3. Poland is the only European country of origin. The rest are mostly from South and Central American and Caribbean island nations. DACA's repeal could make the beneficiaries of the program immediately eligible for deportation. It could also strip them of their work permits and rescind in-state tuition for undocumented college students. The program also allowed its recipients to obtain social security numbers. A study issued in January by the CATO Institute – a libertarian think tank – estimated that deporting all 800,000 DACA recipients – also known as DREAMERs – would cost the federal government $60 billion, and reduce economic growth by $280 billion over the next 10 years, according to a report published in India West. It's now urgent for US Congress to act before DACA ends in the next six months. While a permanent fix by Congress to legalize the status of young people who were brought undocumented to the United States is the right long term solution, it is still a bad idea to end DACA over the next 6 month, particularly if Congress fails to act in this period. It's bad not only for the young people affected by it, but also bad for the US economy to lose so much talent and energy in a short amount of time. Most common age of whites is over 50. Most common age for Latinos is 10. Most common age in U.S. among: Whites: 57 Asians: 28 African-Americans: 26 Hispanics: 10 Bi- or multi-racial: 0 as of June 2017. Tide cannot be turned. But aging whites (and boomers) will miss the fewer helpful people around to support them in their aging life. America will shrink; and not just demographically.